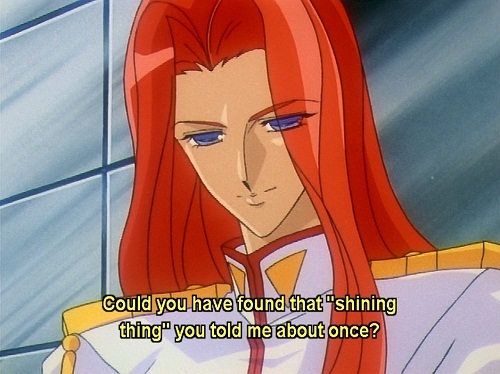 bateszi has already ruminated on the connection between Star Driver and Utena and while I’m a bit late to the party, I wanted to add my own reflections. Right now I’m watching Utena for the first time while finishing Star Driver on Crunchyroll. 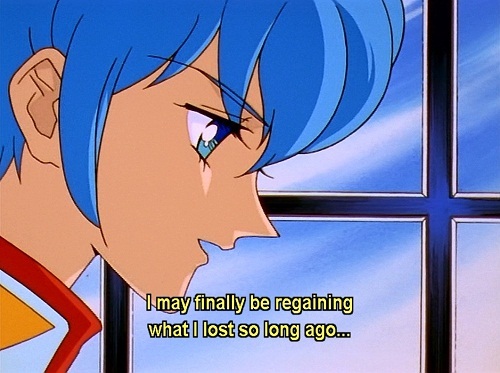 Fortuitously, I just finished Episode 4 of Utena a few hours after watching Episode 21 of Star Driver. The scenes below are from these episodes. 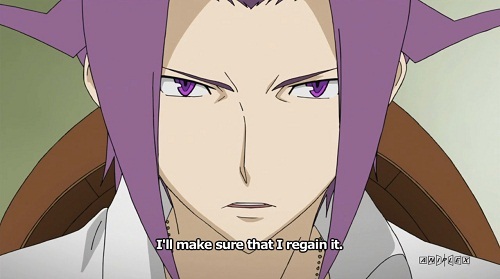 As I mentioned above, I’m not going to go in depth about all the ways Star Driver and Utena are the same. If I wanted, I could write an entire post about how the shows have similar art styles, how each has a woman with a small animal friend and how both shows center around duels and school. Instead, this post is mainly about my pleasant suprise at seeing the symmetry in the images above, a fitting tribute by Takuya Igarashi to Utena, which he worked on (and discusses in an interview here). 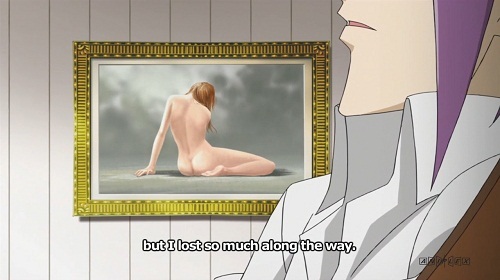 In addition to the similarity itself, what struck me about the Star Driver scene above (apart from the semi-naked background painting) was that the message was delivered by a villain. This maintains the symmetry with Utena (where a villain delivered the line), but it also highlights how the villains are the most interesting part of Star Driver. Although the hero in Star Driver gets stronger easily, it is the villains, through pain and technological progress, who work hard to gain strength and evolve. This is the opposite of most action shows, where the villain has effortless power but the hero catches up only through hard work. I haven’t finished Star Driver, so I can’t say what role the villains will play in the ending, but I’m hoping their role continues to be nontraditional. Otherwise, I’m going to be the one who has lost something along the way. I thin one of the main things to note in regards to these two lines is that, as is eventually revealed, neither is truly a villain – it just so happens that their motivations are in opposition to the protagonists’, but not really wrong per se. While this may seem a matter of technicality, that to me is a part of what’s truly brilliant about Utena (and Star Driver). 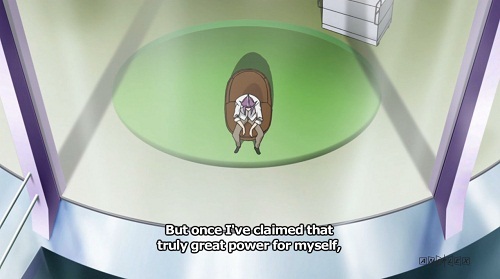 The motivations of all characters (particularly as played out in Utena), the main ones included, live in a sort of gray space. Each character has their own distinct justifications for their actions, no matter how obtuse they may seem to be, and no one character is in a position to judge another right or wrong, though they often do, causing conflict. I thought about this issue when writing my post and ultimately went with the word villain anyway. It seemed a simpler label to use rather than to call the character an antagonist. I agree that villain isn’t as accurate a description for the Utena character as antagonist, although villain seems more accurate from what I’ve seen of the Star Driver character. But I think most villains, even villains that are wrong per se, live in a gray space. I think a character can be a villain and still have a reason, even if twisted, for their actions. I suspect many see their actions as for the greater good. Otherwise, if villains didn’t have a justification or excuse, they wouldn’t be believable.